We received a call from a friend of ours about an hour ago, asking us to break into their email and look up some Evite information. Why? Because they were heading to a Wrigley Field Opening Day part just down the street from the old yard, and they'd lost the directions. Our friend is a Cub fan. We directed them to Sheboygan. But only in Wrigleyville do they have an opening day party at 1 p.m. on a freezing Friday. 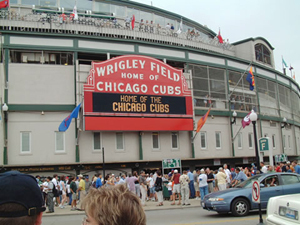 You know life is looking up when they're playing baseball at Wrigley Field again, and in about a half hour, the new, "improved" Wrigley Field is ready to host the Cubs' home opener, against our beloved St. Louis Cardinals. As long as it doesn't rain. Just think, in less than 60 hours the Cubs will likely be 4 1/2 games behind the Cardinals and in last place in the NL Central. What a mess this team is.